When you are married, you share everything. You share all the money you make, and you share the liability for any debts or taxes. That means that when your spouse gets snowballed by debt, so do you. That also means that if your spouse gets on the hook with the IRS, so do you. Sometimes, the person you trusted isn’t always trustworthy. Your spouse may have accrued debts you didn’t know about or may even have a secret income. You may not know about these things, but you can be sure that the IRS does — it’s their job to know about these things. Your first sign that something might be amiss is a notice in the mail from the IRS that you owe back taxes or that you are now facing penalties. You may think that you’re in the clear since the income wasn’t yours and you didn’t know about it, but the IRS won’t see it that way. Innocent spouse relief is available for some, but it can be a complicated and drawn-out affair to apply for and obtain it. Instead, it is better to do what you can to avoid having to work with a tax lawyer and apply for that relief. Here are a few things you can do! Most married couples file jointly, partially because they think they have to and partially because they can pay fewer taxes when doing so. However, filing jointly puts both spouses on the line for the tax debt, even if one of the spouses is hiding assets from the other. If you file separately, you can make a stronger case for having separate finances and not sharing the liability. You can strengthen your case by maintaining separate bank accounts. However, in some states, such as Arizona, married couples do not have the option to protect themselves in this way. Arizona and many others are community property states, which means that even if you file separately, you share all rights to your spouse’s assets, as well as all responsibility for debts and have to report one-half of your spouse’s income. If your spouse really wants to hide assets from you, they will. However, many spouses are able to hide finances not because they are technical geniuses but because their partners leave all financial control to them. You can minimize your risk by taking an active role in your marital finances and checking all your bank, credit card and other accounts regularly. Even if you are not the one writing the checks or paying the bills, you should be keeping tabs of these things and double checking the information your spouse provides you. Ask questions about anything you don’t understand or anything that seems suspicious. Also pay attention to your mail. If you don’t know about an account your spouse is hiding, you may be able to intercept a statement or some other information about the account in the mail. Most accounts will show up on a credit report, unless your spouse has paid in cash for an asset or is using another name. However, if those things are the case, you have much bigger problems on your hands as your spouse is likely in deep with some financial double dealing. In most cases, if you run your spouse’s credit report, you will find any accounts that have been opened. You should also run your own credit report in case your spouse has opened an account in your name. Check the report at least once a year to maintain your financial health. Check it more often if you think there may be suspicious activity. Checking your credit reports won’t find income that your spouse is hiding, but it will let you know about hidden accounts, which can tell you that your spouse is up to something. That can start a conversation. You may also consider hiring a private investigator if you suspect your spouse is hiding finances but you cannot find evidence of it. The sooner you can get to the bottom of the situation, the sooner you can take action to protect yourself. If you do get a notice from the IRS that you owe taxes because your spouse was doing something you didn’t know about, you need to call a Phoenix tax lawyer right away. Silver Law PLC in Arizona may be able to help. We represent clients in cases of innocent spouse relief, as well as other issues involving collections, audits, and tax litigation. 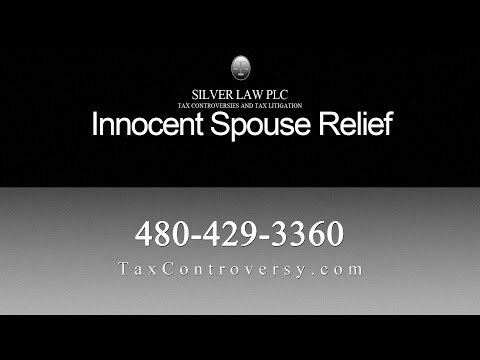 Our attorneys will help you understand your rights and your options for gaining innocent spouse relief or other tax relief. Call us today to start talking to one of our attorneys and start protecting your financial future.